It is often impossible to ascertain what Russia has been responsible for despite ‘evidence’ or conjecture. So it is with the story of Scalextric produced in Russia! Did they or didn’t they? Many Scalextric enthusiasts are aware of the NOVO branded Scalextric sets. BUT! Were the Sets made and sold in the UK, Russia or somewhere else? “New for 1978 Novo introduces “G.T. Racing”, a super value slot racing set. Over 4 metres (420cms) of dual lane flexible track with high speed curved banking ensure record breaking speeds from the Lamborghini and Mirage Ford which are included in the set. Variable banking supports and crash barriers help keep the cars on the track and speed is controlled by the pistol grip hand controllers.” G.T. Racing set was catalogue item 78001. The Novo set was NOVO, of course, but all tooling still had the Scalextric logo and patent information engraved in to the steel so the resulting plastic products had the well known Scalextric logo and information moulded in to the plastic. The Sets were made with the very tooling that DCM owned and used at the Margate factory so the Sets were genuine Scalextric products made in the USSR under license. Paperwork in the Set was in Engish entitled “Auto racing”, “Test-experimental (proof) Office of Moscow”, ”220 volts”, “The toy”. “Electronic toy assembly. “The training path”, “Guarantee education” and also a note showing a production run of 15,000. The set had two cars; C15 Ford Mirage and C17 Lamborghini plus various track sections. This was made in St. Petersberg and had ‘Made in USSR’ stamped underneath. The Ford Mirage was made in a drab green colour and the Lamborghini in a pale yellow. In addition it is possible that a Ferrari P4 was made but in a dull red colour. The C13 Tiger Special was also produced, with ‘Made in USSR’ on the underside, and sold in bright green and yellow versions – two very rare colour variations to collect. All cars appear to have been fitted with yellow wheel hubs. The second version of the Set was manufactured in Moscow, and possibly at several other Russian locations, for the Russian market. The Set card box is made of a heavier card with the set artwork very similar but the text and titles were all in Russian. The cars and track also varied considerably from the St. Petersberg made items. The engine and axle carrier/chassis used a different moulding without the ‘U’ shaped aluminium bracket, the guide blade is larger. The driver pan is different because of the new rear axle/motor assembly but the motor is the same as the Novo motor. The track and barriers were also a new tooling. The track had a sleeved slot, metal rail pins to connect one track piece to the next and a yellow plastic links which hooked on to the track edge corners to physically hold the track pieces together. The barriers had a ballastraded design and the controllers no longer featured the name Novo. The car bodies of the Lamborghini Miura and a Ford Mirage were moulded in red and blue colours respectively. From the descriptions it can be seen that the Set wasn’t a copy of the Novo Set but a re-engineered product to suit production methods or requirements of the Socialist countries. So, at first glance, the Soviets did make Scalextric sets in Moscow for Russian and the Eastern Bloc countries which, whilst NOVO exported Sets made in St. Petersberg, Russia to the UK. The statement from DCM infers that there was an agreement with the Russian State to make slot racing Sets using tooling and intellectual property (IP) supplied by DCM. It would appear that NOVO, having the tooling for the car bodies and wheel hubs and a supply of motors, produced a quantity for the Russian producer(s). However, as all components (with the exception of the car bodies, motor and wheel hubs) have been re-engineered the resulting slot-racing product can’t be called Scalextric at all, although it is a distant comrade. Other products involved in this international arrangement with NOVO included FROG plastic kits and BIG BIG TRAIN – also produced in the Scalextric factory at Margate. In 1977, Novo Toys applied to Peterborough council for approval for factory and office extensions and for retention of temporary office buildings but both were not approved by the council. Novo ceased trading in 1980 and liquidation was completed in 1985. So, ‘No!’, Russia didn’t make Scalextric products… technically! …probably! Let’s do the history first! We all know, don’t we, that any Bentley is a high value prestigious vehicle aimed at high society. Well, they were but that didn’t excuse them from being (ab)used on the race track. Bentley had a 3 litre model and a 6.5 litre model. The 6.5 litre model had the potential to win but needed something extra. W.O. Bentley didn’t approve of forced induction systems but, nonetheless, Sir Henry ‘Tim’ Birkin made five blower Bentley’s for the Le Mans race. Two cylinders were removed from the 6.5 litre engine reducing it to 4.5 litres (or thereabouts) and a supercharger, otherwise known as a ‘blower’, was fitted to the front. Fifty-five copies were made by Bentley to comply with Le Mans homologation rules. Tim Birkin was one of a small group of racing enthusiasts, to later be known as the ‘Bentley Boys’, who would go on to help the team see the Bentley 4.5L ‘blower’ cars to victory at Le Mans over a winning streak from 1927 to 1931. The rest is history, including the sale of Bentley Motors to Rolls-Royce during the 1930’s financial recession post Wall Street. The racing successes made this car a famous British icon carried in the hearts and minds of a growing public awareness of motor sport. When collecting Scalextric cars one will undoubtedly come across the between-the-Wars Bentley or the current Continental GT3 cars. Both handsome beasts and certainly both are monsters on the race track. Not to everyone’s taste but they can’t be ignored as Scalextric models as there are standard issues and some very, very rare pre-production models as well as very, very rare fully decorated models. In 1962, catalogue 3 displayed the new Scalextric 1929 Bentley 4.5 Litre race car complete with a blower in front of the famous radiator grill. Referenced as C64, it was available in black or green. There are some quite delicate parts to the design of the model. The headlamp stalks, the four mudguards and the fan-tail exhaust would very likely be the first components to break or go missing. Pretty much the same as the real race car! Today, a second-hand in a far worse state than this can be found but the fun is in the chase for a nice boxed and unspoilt model. They can be found, at a price usually, but they were produced in goodness knows how many thousands in green but the black Bentley is the hardest to find. The black version was only released once, hence the rarity of this livery. A Scalextric Set was the place to begin one’s fascination with electric model car racing and Scalextric were quick to also release a Bentley set. Referenced ‘V3’ and named ‘Vintage Motor Racing’, the set contained both black and green Bentleys. The second Scalextric factory, located in Calais, France was also producing the entire Scalextric range as fast as it could to meet the incredibly high market demand during the 1960s. Tooling moulds were often shared between the UK and French factories. In France, the Bentley was issued in the green livery as well as a lower number of black versions. These can be identified by the light brown tonneau covers (grey for the UK) over the rear seats and red spoked wheels (black for the UK). The underpan may be embossed, using an interchangeable insert inside the steel mould, as ‘Made in England’, ‘Made in France’ or simply a blank space where the ‘Origin’ stamp wasn’t available ((or forgotten!). The more common green variant was also released in 1982 (C305) as part of the ‘Vintage Collection’ series, a little know release in 1986 (C839 but identical to 1982 C305) and then again in 1992 as part of a ‘Power & Glory’ collectable range following a TV programme called ‘The Power and the Glory’’. A dark blue version was released in 1995 (C242), and in Spain as H242 under Scalextric’s Superslot brand created for the Spanish and Mexican markets, as part of another collectable range called ‘Racing Classics’. Why blue? As far as I know, it didn’t reflect any of the full-size race cars but at least it was something other than ‘another green one’! The guide blade, motor and entire underpan evolved as the decades rolled past. A complete specification of each model is in the ‘Ultimate Guide’ book. Note: On a black Bentley, beware of replacement mudguards or head lamp stalks painted black! For something different turn to the pre-production and other factory prepared models such as the chromed Bentleys giving to guests to the factory, to race competition winners or for other special occasions. It had always been quite normal for Scalextric to use the technique of chrome-plating components such as bumpers and lights to provide a rather unusual prize or gift of a car completely chromed and, usually, mounted on a wooden plinth with a plaque marking the occasion. Chromed Bentley’s are interesting items especially if the provenance of the plaque or story from the recipient accompanies the model. Pre-production models are very rare but they do turn up. Models in white, blue and red have been seen and are photographed in the ‘Scalextric – Ultimate Guide, 8th Edition’ (see page 398). There are only two recorded models of the red car. One of these and had been painted green when it was produced at the factory and decorated as a display example for its forthcoming release in to the Scalextric range and had remained undiscovered for thirty years before it was realised. These Bentley models were presented in a variety of boxes from the original card light blue with black & white chequer, the French version of this has a striking pink to one end of the box. The Power & Glory, Vintage and Classic collectable ranges have raised backing cards with attractive graphics. Coming up to date, 2012 saw the introduction of the Bentley Continental GT3 to the race tracks of the world – a welcome return for the famous Le Mans winning brand name. The 4 litre, V8, twin-turbo, 550bhp GT3 race cars are still being developed for racing after 120 podiums and 45 race wins. Pretty impressive. Scalextric began with the fully detailed white and green Works liveried car (C3514) and the ‘super-resistant’ ‘Generation Bentley’ team car (C3515) in 2012. All GT3 Bentleys are fitted with a DPR chassis. Since 2012 the white/black M-Sport (C3595), a green No85 (C3713), white ALD No84 (C3714), a white 60th Anniversary celebration (C3813A), a red/black ALD No84 and a blue ‘ONLYWATCH’ No84 cars have been released. Perhaps a few more will follow these. A Bentley race Set was released with ‘road’ versions of the car. The Set, C1349 Bentley GT3 Racers, contained a black/red car and a black/white car. Both cars had no other decoration and might, perhaps, be typical of ‘play things’ the rich and famous might commission direct from the Bentley factory! Once again, an anomaly has been thrown up with a particular model. C3515, the Generation Bentley car, should have a white body with blue, silver and grey Union Jack flag on the roof and flanks. 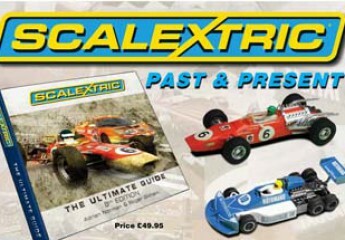 A few incorrectly decorated pre-production samples were released by Scalextric to the collector’s market via various fund-raising and marketing events in the UK. These variants have a silver body instead of white. More variants include GT3 Bentleys used for testing decoration techniques. About ten bodies were sprayed and painted in several techniques to create some interesting designs at the Margate factory. A number of these samples were issued as prizes or samples for feedback. There are only two known body types, one of which was only part of the engineering process when it was discovered that early pre-production samples have two air-jack connectors on the rear boot valance instead of the eventual (and correct) single connector. Tooling differences can be interesting to collectors. Finally, just as there was a very rare plain red 1929 Bentley 4.5 Litre there is also a very rare plain red Bentley Continental GT3 out there somewhere. The GT3 cars come in three packaging styles; blue base, grey base and card boxes. Which to collect, then? Both super-cars of their days, the Bentley range of Scalextric cars is a definitive and achievable collection if sticking to the mass produced standard range and enough to fill a very presentable and modest display cabinet. On the other hand, where thee fun is in the chase, seeking the rarer 4.5 litres or GT3 cars will be an enormous challenge. The cars described here are NOT a definitive list. There are at least twelve 1929 Bentley 4.5 Litre variations and twenty-four GT3 variants! Whichever the preference, they are probably a ‘must have’ in most collections. Bentley 4.5litre: pages 82, 393, 398, 411. Bentley Continental GT3: Page 82. Following the Margate Swapmeet of 2017 held five miles away from Margate we have now negotiated with Hornby Hobbies to hold this year’s swapmeet in the Scalextric factory. Venue: Hornby Hobbies Visitor Centre, Westwood Ind Est., Broadstairs, Kent, CT9 4JX. Time 10am to 3pm for the public. * The event is aimed at attracting local people as well as collectors and racers. With a rich history of Scalextric in the area we hope that many ex-Scalextric employees will visit. * Track layouts for the public to try out. * Trade and enthusiasts stalls for swapping, selling, buying. * Club and Magazine stands. * Advertised on local radio, papers and social media. * Ample parking, easy loading access. Access for the disabled. * Full amenities with recently reintroduced cafeteria serving snacks, coffee, tea, etc. * The venue, with easy access via Calais-Dover, is geographically central to Paris, Brussels, Rotterdam, Aachen, Manchester, Swansea, Plymouth and Hull. * The venue is 20 miles from Dover but, more importantly, inside the old Scalextric factory. Please SHARE & LIKE this information and image in your social media and local communities. The Scalextric and Hornby Railways production plant was closed down around the turn of the century and continued as an administration head-quarters for a further decade before selling the site and moving their administration home to Sandwich in Kent but maintaining the Hornby Visitor Centre at the old factory. Throughout the history of Scalextric, occassionally, a ready-to-race (RTR) Set is released exclusively to a targeted market. This Daytona rtr set was released in the USA in 1988 and exclusively sold through the ‘Children’s World’ toy chain. The basic track shape is of the Daytona tri-oval race circuit’s in-field road course and itself is unique to this Set. It is unclear how the Set format was decided upon, or who decided upon it. It is possible that this was a specifically commissioned Set from a US source and sold through ‘Children’s World’ in the USA. Collecting cars from rtr Sets is a common theme since quite often the cars in Sets are unique to the Set and not released as solo cars. Sometimes, solo versions of Set cars only differ with some extra decoration but every now and then a Set may have completely unique livery. Alas the artwork on some rtr Sets can be deceiving. Usually, the car liveries on the Set box lid will be replicated on the models within – not so with Set! The box lid artwork shows the Jaguar XJ8 bearing race number “88” on the car but the car within the Set bears the regular number “60” as issued on regular release solo cars. In the 1988 Daytona 24hr, Jaguar ran race numbers 66 and 67 (and generally in the US always 60,61,66,67). The No. 88 livery was the Jaguar Castrol presentation car shown in advance of the 1988 IMSA season. It is likely that the Scalextric art department only had images supplied to them by the sponsors Castrol and Jaguar or that they sourced imagery from the media and press not realising that the eventual racing livery would bear a different race entry number. The model cars photographed on the Set lid are not production Scalextric models.Bth the jaguar and the Porsche are either ‘borrowed’ from another manufacturer or are early plasticard models from the Scalextric engineering department. An interesting rtr Set only sold in the USA. The Scalextric James Bond set from 1967 – Boxing clever! It’s is difficult to find a James Bond Set from 1967/68 these days and just about impossible to find a mint one. Well, does one exist! Using reproduction boxes is a sensible way of preserving rare Scalexric items. Repro boxes for cars have been around for decades and are very well accepted. Boxes for Sets, though, are not sought after – even the originals are usually dispensed with even if they are in mint condition – EXCEPT, that is, for the 1967/68 James Bond Set box. The James Bond Set box is worth more than most collectable Scalextric cars so, this box is always repaired or preserved but rarely thrown away! Richard Johnson offers an excellent quality reproduction James Bond set box (search for “Scalextric reproduction boxes” on Facebook). A significant part of Scalextric sales has always been achieved by producing sets based on characters or cars appearing in popular films or television series and, of course, ’James Bond 007’ is no exception. James Bond 007 was the first of the special Scalextric themed sets, available during 1967-8. This followed the success of the full-length features films, ‘Dr No’ 1962, ‘Goldfinger’ 1964 and ‘You Only Live Twice’ 1967. The Set disappeared from the catalogue after just two years, which explains why they are difficult to find and command a very high price. Surprising perhaps as the films were enormously popular. Their discontinuation was possibly prompted by high development and production costs resulting from the complexity of the special cars and track items, which made the set quite expensive. 007’s car, a white Aston Martin GT, was extensively reworked from the basic Aston Martin (C68). The main body alteration from the standard model was the construction of the body shell in one piece. The underside was open to allow for the passenger seat ejector mechanism, while the incorporation of a sunroof allowed the spring-loaded seat to eject its passenger. A ‘Race Tuned’ type of swivel guide blade was also used. A further feature of the 007 Aston Martin was the spring-loaded rear number plate, which when rammed by the pursuing Mercedes raised a ‘bullet proof’ screen behind the rear window. The track section in the set included straight and curved chicanes and a 90° crossover. Other set contents included a special straight track section with a concentrically mounted dummy ‘rock’, which is allowed to turn freely in its mounting. The passage of the cars going past gradually turns the rock around, and it is so shaped that when in a certain position the rock will hit a lever mounted under the side of the Aston Martin as it passes and send the passenger flying through the sunroof. The villains’ car is a black Mercedes 190SL, standard except for a long wire spring fastened to the body in front of the rear bumper, which, when the bumper is hit, causes the car to overturn. The normal racing driver figure is replaced by a gangster type in a mask, accompanied by a passenger leaning over the windscreen with a gun. A wire roll-over bar fitted behind the rear seats completes the changes. The standard production C75 and C94 Mercedes 190SL continued to have the hole in the passenger’s compartment and the extra moulding underneath where the overturning spring was located on the 007 version. The cars were never available individually, so no factory ‘C’ reference numbers were ever given; neither do they appear in price lists or other literature. However, C97/C68 is stamped onto the underside of the Aston Martin, so the reference number C97 can correctly be used. Whilst perhaps it is logical that C98 could have been allocated to the Mercedes 190SL it has to remain without a separate official reference number. It seems that the cars were intended to be available outside of the set in the HP4 007 Accessory Pack. Though a pre-production example has been seen on the collector’s market it doesn’t appear to have been produced officially. It is probably true to say that more solo James Bond cars are circulating in the collector market, than the boxed Sets. It is quite difficult to find a Set box that has not all but collapsed! Though the quality of box was pretty good for the era the sheer weight of the contents was enough to break the base of the tray. The yellow card inner sections which hold the track, cars and accessories in place, will not do their job with a collapsed tray. The contents would fall out and parts lost – the ‘shooter on the bank’ figure being particularly difficult to find! The lid would likely lose its form and become damaged rather quickly. So, being a Film related item, unique Scalextric content in track, cars and accessories and a disintegrating Set box made the entire ensemble a pretty rare item. For a James Bond Set box that needs repairing or replacing there is an answer – buy a reproduction box! So, I searched online and found that I could buy the fully decorated lid, the tray and yellow inner sections. Richard Johnson offers box, the inner pieces or both. I soon found myself in discussion with Richard to find out more about his offering which happily revealed an interesting story about how he researched the project. Richard found that the original box and most set boxes were high quality back in the day and would have been quite costly to produce. The owner of the printing service that Richard used reckoned that Scalextric didn’t cut corners because back then word would soon get about if it were sub-standard. Also, the set would be shipped in the box so it would need to be sturdy as well. Unfortunately, the 007 Set box together with the quality contents made it expensive for the day and hence a rarity today. When Scalextric made the boxes, the print placement wasn’t very accurate so all original boxes vary with the main picture not always in the dead-centre of the box – though you can’t tell unless you put a few original boxes next to each other, then it’s quite obvious. Richard described the biggest challenge was trying to reproduce the print. “The box,” Richard said, “…started with was pretty much mint although faded to some degree with some small tears which had to be digitally removed. Trying to get the colours right was tricky, too dark, too light, too red, too yellow. It seemed to go on forever until we got it almost perfect. The insert was quite straight forward although colour was an issue again as the original yellow on my insert was bleached so took a few goes to get it right. On making the insert from flat pack I can see why so many inserts are torn in the same places. I think this was done at the factory from new and not the contents of the box tearing it. Pay special attention to the track end of the insert (not grass bank end) as this, when bending to shape, will tear in the same place as the originals, so don’t rush it! I stamp all the pieces with “Auric Enterprises 1967” as a homage to Auric Goldfinger the best villain ever! The stamps distinguish the reproduction box parts from the original. All the parts of the reproduction box are exactly the same dimensions as the original, so they are interchangeable with the original.”. Having kept an eye on third-party Scalextric products, or ‘Code 3’, as such products which are further worked on by someone other than the manufacturer are known in the auction and collecting world, a reproduction box is better than no box. Check out “Scalextric reproduction boxes” on Facebook for more information about Richard and his box.